A 401k hardship withdrawal may seem like a solution when money is tight and you need financial assistance, but there are some rules in place that you should remember before deciding to take this money out of the account. For some individuals borrowing from 401k plans may be the only option to ease a financial hardship, and this is allowed under the rules and is permitted by most employers. An employer does not have to allow this option though, so you should check your plan first before evaluating this option. A 401k hardship withdrawal will make you ineligible to contribute to your 401k plan for six months following the withdrawal. The 401k withdrawal rules outline exactly what hardships are allowable. These include unpaid medical expenses which will not be reimbursed, a principal home purchase or to prevent foreclosure on your principal residence, certain funeral expenses, college tuition, and other circumstances. The financial hardship can be caused by you, a spouse, or a dependent child for a 401k hardship withdrawal to be allowed. A penalty is applied to make this withdrawal if you are not fifty nine and a half years old, and this is ten percent of the amount withdrawn. A withdrawal is not treated like a 401k rollover to IRA or other transfer, because the amount in your retirement fund is lowered permanently. 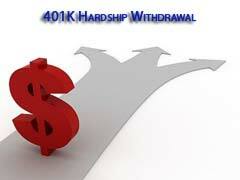 Utilizing a 401k hardship withdrawal can be expensive if you are hit with the taxes and the ten percent penalty. Unlike a 403b rollover, the money you withdraw due to a hardship is gone for good. The steep cost makes many experts caution against this route if there is any other option available. Not only do you lower your retirement account balance but also your 401k contribution limits for the year because of the six month contribution ban. It is also important to remember that you can only make a 401k hardship withdrawal for the amount needed to cover the financial hardship and the associated withdraw costs and penalties.